As the most popular website, YouTube enables you to listen to various popular music online and watch billions of videos of various types. You could upload videos and music to YouTube for sharing, and with the help of 3rd-party YouTube downloader, you could also download music and video from YouTube for other uses like embedding into PowerPoint as background music. In this guide, we would like to introduce you effective ways on how to embed music from YouTube to PowerPoint in detailed steps. The first solution to help you embed music from YouTube to PowerPoint is Leawo Prof. Media, which includes an Online Video Downloader and a Video Converter. The Online Video Downloader helps you download video files from over 500 video sites like YouTube, Veoh, VEVO, etc., while the Video Converter helps you convert the downloaded videos to music files for embedding to PowerPoint files. 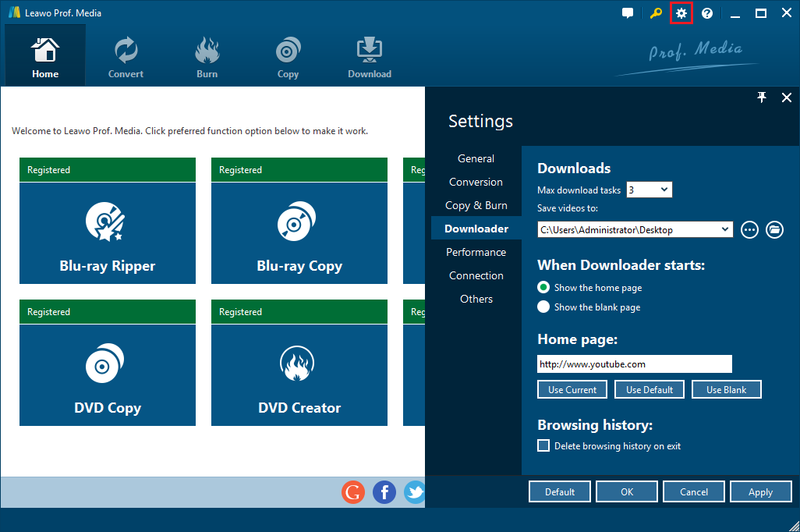 Just download and install this Prof. Media tool on your computer. Then launch it. Follow the below steps to learn how to download YouTube music for PowerPoint firstly. Click the wheel icon on the top-right corner and then navigate to the “Downloader” tab to set output directory in the “Save videos to” box. Make sure the target drive has enough space to save the downloaded YouTube videos. Open the “Download” module and then make use of the internal browser to browse the target YouTube video that includes the music you want to download for PowerPoint. Once you’ve reached the target video page, play it back to verify if it’s what you want. Then, on the right sidebar, you could see multiple download options in different resolutions, quality and formats. Choose the one you want to download. Actually, sometimes there are MP3 file options for you to download. That is the music file of the target video. 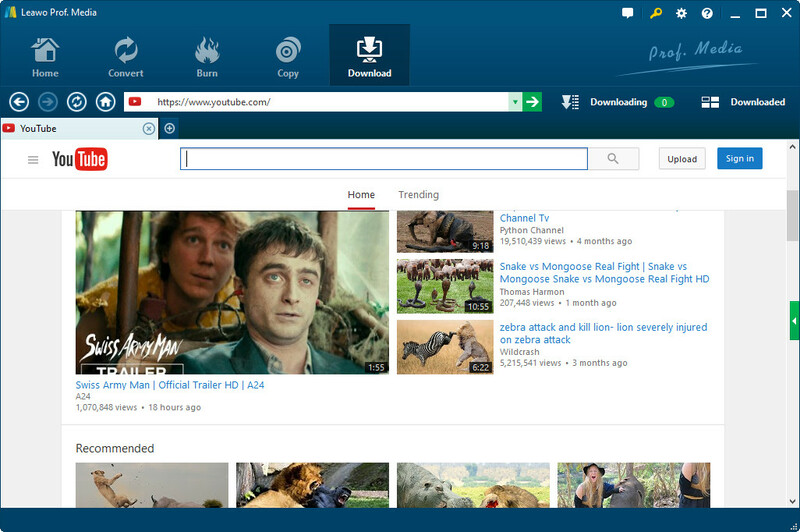 Then, after selecting the target video to download, click the download icon to start downloading YouTube video. After downloading, you need to make use of the internal Video Converter to convert downloaded YouTube videos to MP3 audio files for PowerPoint. Actually, with Leawo Video Converter, you could convert YouTube to Apple TV, make iPhone ringtones from YouTube video, convert YouTube to MP3, etc. It could convert video files between hundreds of video formats like FLV to MKV, MP4 to MKV, MP4 to AVI, AVI to MKV, etc. The below step-by-step guide would show you how to convert downloaded YouTube video to MP3 for PowerPoint presentations with Leawo Video Converter in detail. 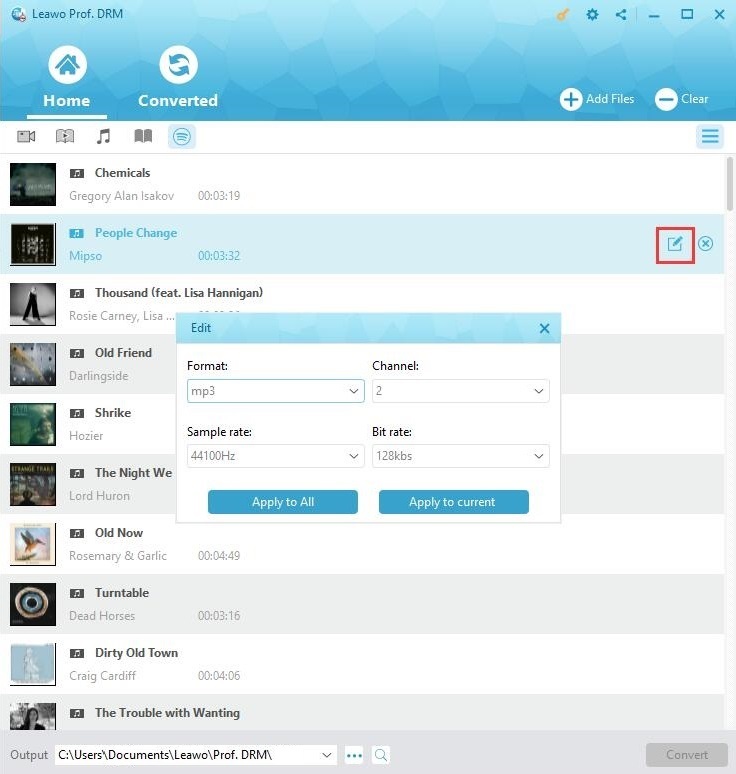 Under the "Downloaded" tab, right click downloaded videos and then choose "Add to Convert" option to add downloaded YouTube videos to the Convert module. Click the button right before the big green “Convert” button and then choose “Change” option to enter the Profile panel. Then, successively open “Format > Common Audio” group to choose MP3 Audio as output format. After setting MP3 audio as output format, click the big green “Convert” button. On the popup sidebar, set output directory in the “Save to” box. 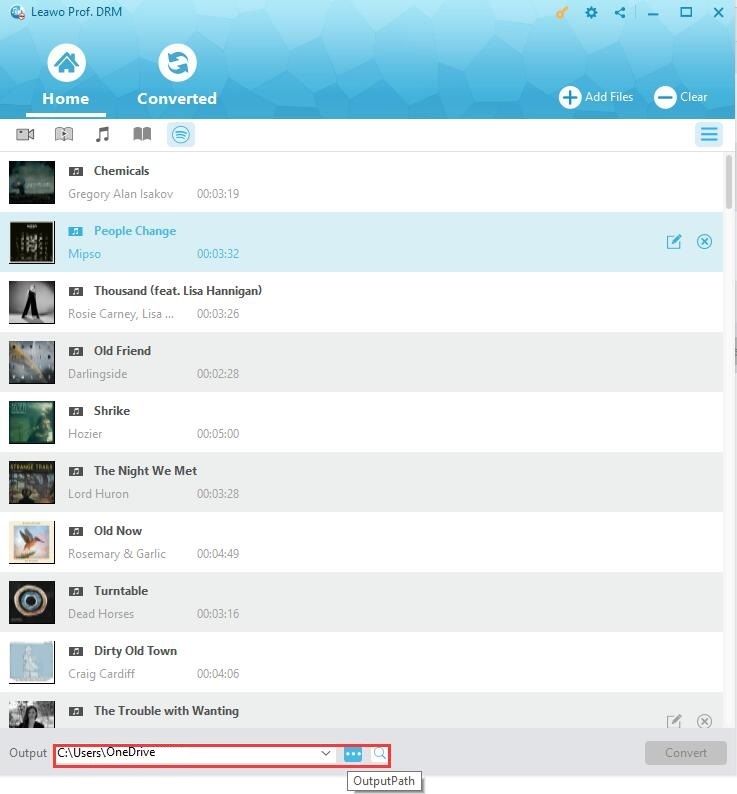 Finally, click the bottom “Convert” button on the sidebar to start to convert downloaded YouTube videos to MP3 audio files. Then, you will get the desired YouTube music files in MP3 format for embedding to PowerPoint presentations. Of course, you could also try another direct way to download YouTube music for PowerPoint presentations directly, without downloading and converting. 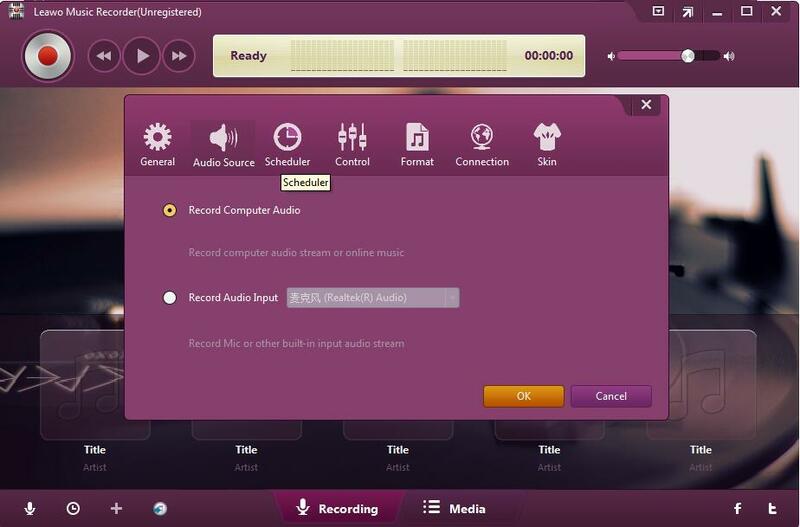 That’s to make use of Leawo Music Recorder, a professional audio recorder program that could help you record any online audio, local audio and external sound of your computer. It could directly record music from YouTube videos and save in either MP3 or WAV format for any use including embedding into PowerPoint presentations. 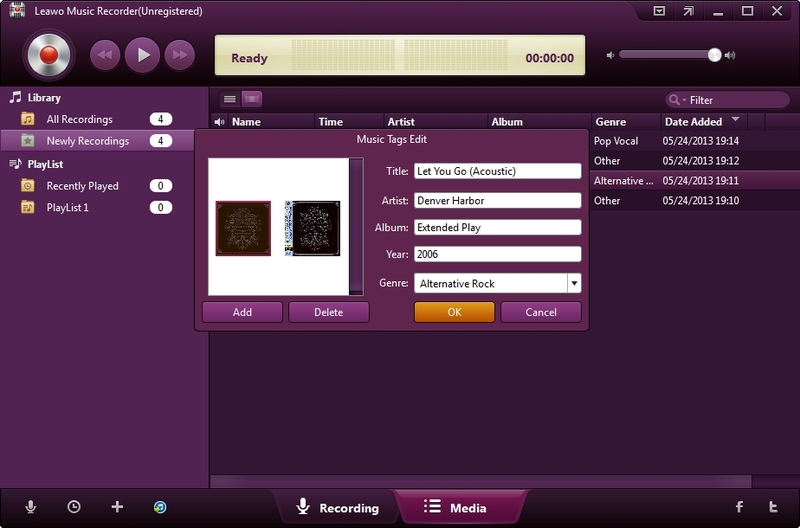 Download and install Leawo Music Recorder on your computer. Then follow the below guide to learn how to download YouTube music to MP3 files directly as PowerPoint background music. Launch Leawo Music Recorder. Then click the microphoine icon on the main interface. On the popup “Audio Source” panel, choose “Record Computer Audio” option. 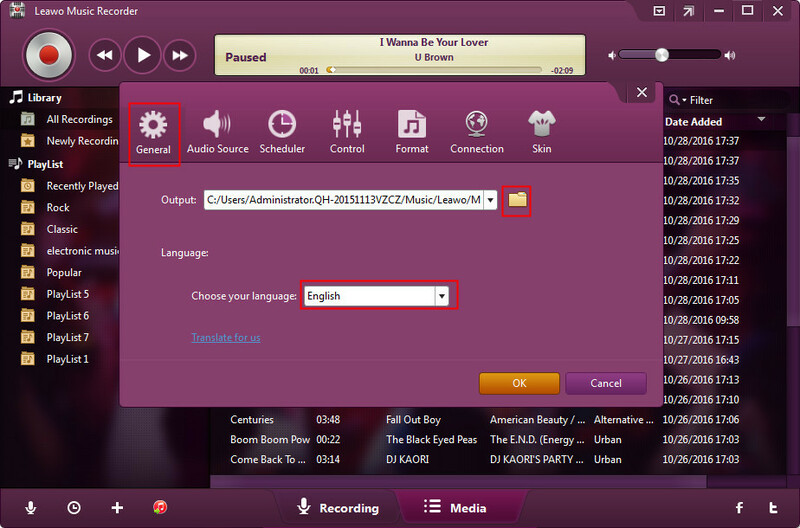 Go to the “Format” tab and then choose “mp3 Audio(*.mp3)” from the “Output Format” drop-down menu as output format. Adjust audio codec, bit rate, sample rate under the “Audio Settings” panel if you need. Then go to the “General” tab to set output directory in the “Output” box. Change program UI language here if you need. On the main interface, click the red start button before you play back songs YouTube video to start recording YouTube music into MP3 file. Note: You could skip the YouTube video clip you don’t want. Meanwhile, it’s important to press the record button before you play back YouTube videos for recording completeness. 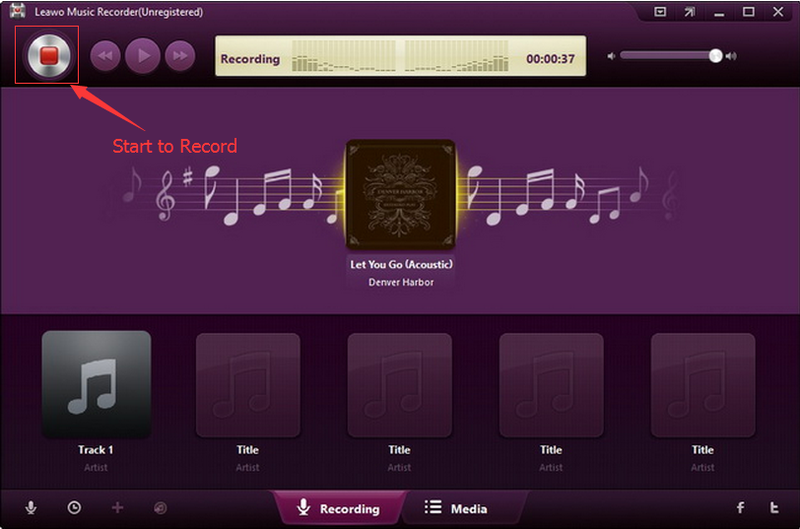 Leawo Music Recorder could automatically download and add songs tags like artist, album, cover, genre, etc. to recorded YouTube songs. After recording, you could see all recorded Spotify songs on the “Media” library and check their song tags. If you need, you could right click any recorded YouTube song and then choose “Edit Music Tags” button to edit song tags manually. After recording, you have got YouTube music files in MP3 files on your local drive. Now, you could directly import the recorded YouTube music to your PowerPoint presentations as you usually do as PPT background music. Sometimes people may want to embed Spotify music to PowerPoint files as background music since you could get more music choices on Spoitfy. However, we know that Spotify doesn’t allow you to download music from Spotify web player or desktop player. All Spotify songs are DRM protected. What can you do to add music from Spotify to a PowerPoint? You could turn to Leawo Prof. DRM to do this. Leawo Prof. DRM is the best Spotify music downloader not only because of its high performance in DRM removing, but also its high quality audio output. 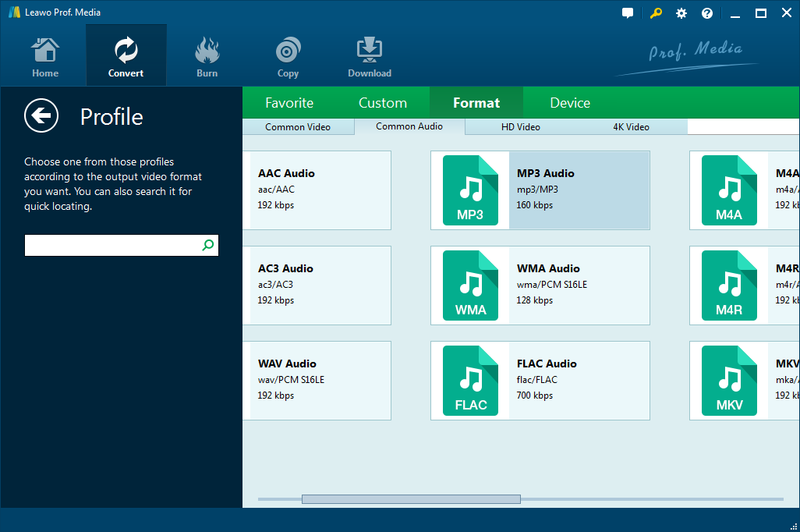 Leawo Prof. DRM could help you convert Spotify music to MP3, M4B, M4A, AAC, WAV, FLAC audio files with high quality, so that you could freely inset Spotify music to any PowerPoint file as you like. 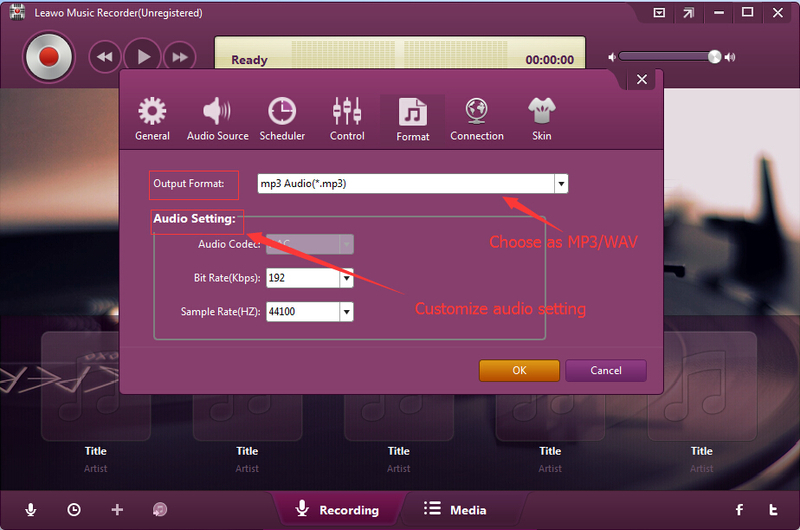 What’s more, it allows you to adjust the output MP3 audio codec, audio bit rate, audio sample, etc. Install Leawo Prof. DRM on your computer first, and then follow the below steps to learn how to download Spotify songs to MP3 files for inserting to PowerPoint files. Note: It would be better for you to install Spotify desktop app on your computer. Launch Leawo Prof. DRM. It will automatically launch Spotify desktop app for you. You can then directly drag and drop your favorite songs from Spotify desktop app to this Spotify music downloader. You could also download Spotify playlist with this Spotify music downloader. Just click the Spotify icon on the “Converted” tab, directly copy and paste the playlist URL of your Spotify music into blank bar on the “Add Files” window. Then, click the OK button to load Spotify songs. Click the pencil icon on each loaded Spotify song title to set MP3 as output format in the “Format” box and set Channel, Sample Rate and Bit Rate according to your needs. Then choose either “Apply to All” or “Apply to current” after setting. Then, set an output directory in the “Output” box at the bottom of this Spotify music downloader. 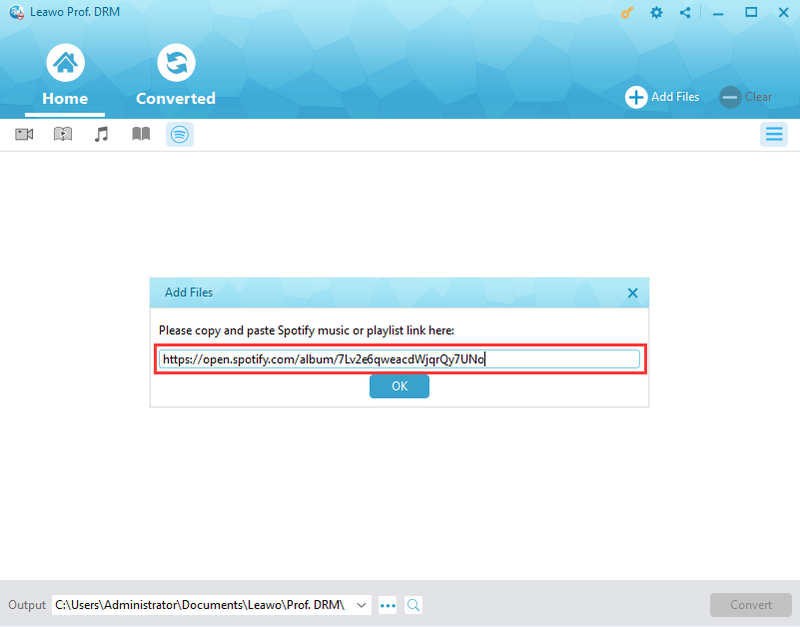 Finally, click the bottom blue “Convert” button to download Spotify songs and convert Spotify songs to MP3 files for PowerPoint files. When the conversion completes, you could import the downloaded Spotify to PowerPoint files freely. In fact, Leawo Prof. DRM is far more than a Spotify song downloader to download Spotify songs as offline files. It could still remove iTunes DRM and convert iTunes DRM M4V video to DRM-free MP4 video, convert iTunes DRM M4P music to DRM-free MP3 file, convert iTunes/Audible audiobooks to DRM-free audiobooks, and convert eBooks from Kindle, Kobo and Adobe Digital Edition. The above solutions would help you easily add music from YouTube or Spotify to a PowerPoint files as background music. The below comparison table would show you their differences in detail. To sum up, Prof. Media is a comprehensive media converter suite that enables you to handle conversions between video, audio, image, Blu-ray, DVD and online videos, along with useful bonus features like 2D to 3D conversion, video editing, etc. Music Recorder is a professional audio recorder tool that enables you to record online audio, local audio and external sound to MP3 or WAV files. Prof. DRM is an all-inclusive DRM removal and converter that could help you handle iTunes DRM video, music, audiobooks, Audible audiobooks, Kindle eBooks, Kobo eBooks, ADE eBooks, and Spotify music downloading.